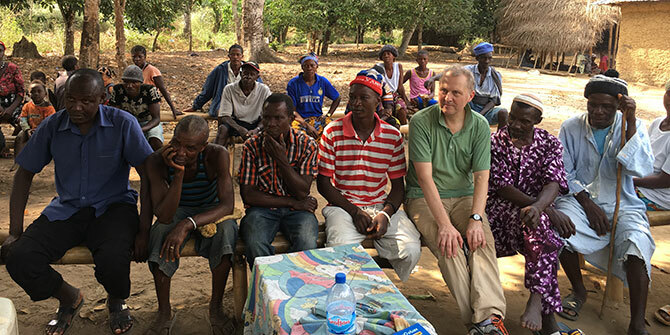 Professor in Practice Duncan Green interviews Professor Tim Allen and Melissa Parker to find out how and why they published a blog post ‘co-authored’ by the people of Mathiane, an Ebola affected village in Sierra Leone. Anthropologists do things differently, including blogging. My attention was piqued by Tim Allen’s reply to a commenter on his recent post (with Melissa Parker) on Ebola in Sierra Leone, in which he casually mentioned ‘It is perhaps worth adding that the chief and elders wanted us to write it, and we read it out at a meeting of the whole village before posting it.’ Woah, is community blogging now a Thing? So I interviewed Tim, Melissa and the three Sierra Leonean researchers they were working with: Tommy Hanson, Lawrence Babawo and Ahmed Vandi, all of Njala University. The story turned out to be even more interesting than the original comment suggested. Melissa: ‘I was sitting in the kitchen area of a hut interviewing a woman who had lost her husband to Ebola at a Treatment Unit. He had been taken there shortly after the military arrived in the village. Melissa: ‘I’ve never encountered such an aggressive response before. I tried to explain that we weren’t an NGO, had never promised to give them things, but hoped that the information emerging from our interviews would publicise their opinions and needs. But they weren’t convinced. I wasn’t scared, but I was concerned and thrown – it was very unpleasant. Then Tim arrived, and suggested a blog. Tim: ‘I’ve been thinking about this for a while. We want to use blogs as a way for African researchers to have a voice, perhaps as a pathway to producing papers. So I had that in mind when Melissa was having trouble, and it seemed like the obvious thing to suggest as a means of responding to these men’s frustrations about not being listened to. We said we would draft it and come back the next day. They said yes and we left the village with a slightly sour feeling. We wrote the blog that evening, went back the next day, and no-one was there. Just a few children at school and an old blind guy. ‘They’ve all gone to dig in the Imam’s field. it’s a long way away’. We said: ‘We’ll go there, where is it?’ They found a young lad to take us and off we went into the forest – it was quite an adventure. We walked for about an hour, down winding paths. 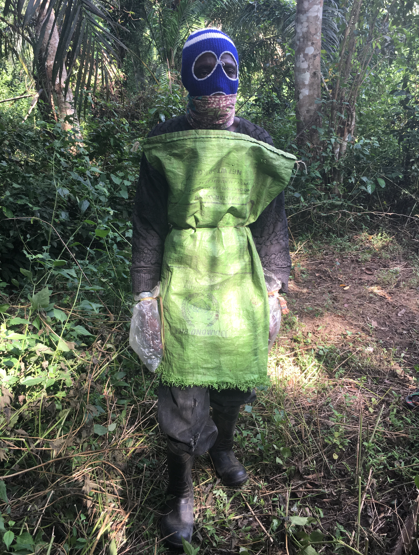 Then got to a swamp and had to wade up to our thighs across a river – we came out into a hidden area surrounded by thick vegetation and huge trees. It turned out this was the place where they had secretly treated some of the sick during Ebola. The men were digging the field, so we spent the morning talking and digging with them – they were rather amazed and found us digging very funny. The guys who had been hostile became much more friendly. While there, we interviewed the old chief; he was very revealing about what had gone on during the Ebola epidemic, told us how his father had died of Ebola, and he had been summoned by the next chief up because they’d heard about the secret burials. He didn’t tell them about his father’s burial, but he was found out and sacked. His replacement was found murdered – no-one knows if it was people in the village, thugs – there were lots of rumours. We spent the morning in the field digging and talking, then stayed for lunch, and came back to the village with them, as their guests. Everyone cleaned themselves up and we called the meeting – everyone was there. Then we read out the blog from the laptop; Tommy was translating line by line. In terms of their suggested changes to our draft, there were few. Some wanted to discuss the theft of a blackboard from the school. Overall, they were hugely enthusiastic, and some wanted their names and photos included. We were reluctant to do that in case there were repercussions for them, and explained that to them. When I read out ‘Everybody made promises and didn’t come back. We care for each other and now we are being punished; where are the NGOs now?’’ – everyone stood up and clapped and cheered! Reflecting on the post we wondered about authorship. We wrote it, but should we have had ‘the people of Mathiane’ as co-authors? Also, what about Tommy and our other Sierra Leonean colleagues? We are keen that they author blogs themselves, but we thought it best in this instance to just put our names as authors to protect people who might be criticised for publicising these issues. But were we perhaps being over-cautious? People in the village said that they wanted to be named. Should we have done so? In the end, we only named the primary school teacher and the newly elected section chief. Was that the right thing to do? This was a quintessentially co-produced piece of work; and we need to find ways of acknowledging this, not only in this instance, but also in future. This post was originally posted on From Poverty to Power.